I'm so happy to be seeing more and more of Janick and her beautiful line Neawear. I just read a wonderful interview on Etsy (via Modish) "Quit Your Day Job". A definite must-read! You must love supply shopping as much as making if you’re a creative person! I can spend hours browsing the Web for all sorts of supplies. In this case, finding the vintage metal hoops is the hardest (you have to be a little lucky, and patient, too! ), since these are becoming more and more rare as time goes by. I spend at the very least 1 hour a week on searching. Now is when I need to have all that passion... and patience! 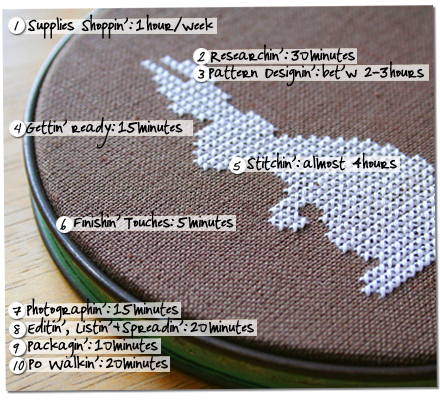 Since I stitch on linen (and not Aida cloth), and the fact that I am a precision freak (lol! ), I use a small table light to brighten under my piece, so that I can see the holes between the threads in the fabric. I litterally count holes in order that everything is straight and perfect. Using my pattern, I go horizontal on a row once, then I come back again to make sure the stitches are all facing the same way. I usually have the TV open or a CD playing — weirdly enough, it seems to keep me focussed. - Between 30 mins and 5 hours, depending on the design. This bunny takes almost 4 hours. *sigh* I just love and adore Janick's work and am itching to have some neawear for my walls....soon. Thank you for this awesome Heart Lab:, 4 Hours for that beautiful little bunny....wow. Janick, your new Wallwear is just gorgeous! Such patience and perfectionism just shines through looking at the pics. And what an incite... Another super feature, Marichelle!! Great stuff!